It's a little bit scary and very exciting - perfect for teenage boys, Department 19 is the series of books that's getting teenage boys back into reading. 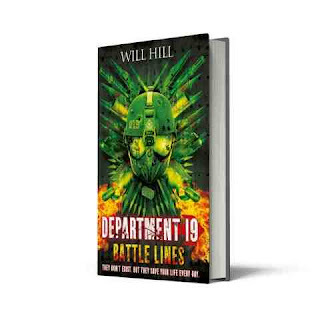 To celebrate the release of the third in the series, Department 19 - Battle Lines I have copies of all books in the series so far available to win. To enter the competition, please leave a comment below naming one of Will Hill's books don't forget to include a way for me to contact you if you are the winner, such as twitter id or email please. Competition will close on Monday 24th June 2013 at 12noon. • Update - Thank you to Everyone who entered. I loved the first book, Department 19, as it was the one that got me hooked! Brilliant stuff! The Rising - sounds an interesting book. Already follow on G+ & have +1ed the post. The Rising is definitely my favourite in the series so far. Both of my kids are now in their teens so no sock monkey business for me, unless I pulled him.